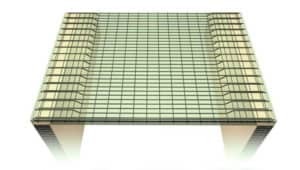 Verandah slab is a type of one way slab, where the slab is spanning in the shorter direction with main reinforcement and the distribution of reinforcement in the transverse direction. 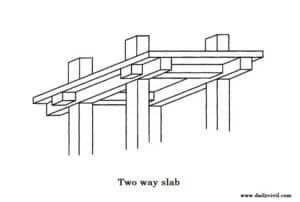 When a reinforced concrete slab is supported by beams on all the four sides and the loads are carried by the supports along both directions, it is known as two way slab. In two way slab, the ratio of longer span (l) to shorter span (b) is less than 2. This types of slabs are mostly used in the floor of multi-storey buildings. 1. In one way slab, the slabs are supported by the beams on the two opposite sides. In two way slab, the slabs are supported on all the four sides. 2. In one way slab, the loads are carried along one direction. In two way slab, the loads are carried along both directions. 3. In one way slab, the ratio of Longer span to shorter span is equal or greater than 2. (i.e l/b ≥ 2). In two way slab, the ratio of l/b is less than 2 (i.e l/b < 2). If you liked this article, then please share & subscribe to our newsletter. good info.hey can u provide reinforcement detailing of canopy slabs? can u give more information in slab reinforcement. I WANT TO LEARN BBS, SO PLEASE SUPPORT ME. more details about oneway and two. way slab reinforcement. Im interested to receive update fr your end.. whats my obligation once subscribed . I want to learn bbs. Yes this article is very important, for me I want to learn more about reinforced concrete design what can I do .